Antique Traditional Design Golden Ball Mala &Chain With Earring beautiful women jewelry. Pretty look copper base material. Gorgeous Look. 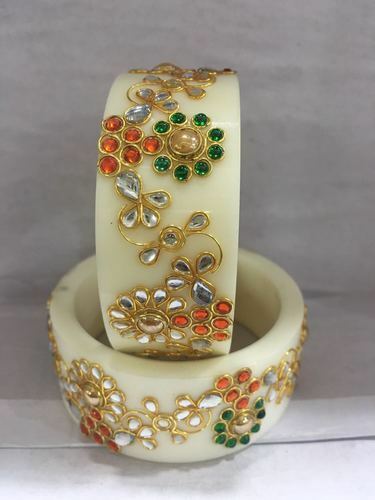 We introduce ourselves as one of the leading manufacturers, trader, exporter and supplier of quality Kundan Bangles, Gujarati Wedding Chura, Punjabi Chura, Bengali Bridal Chura, Designer Chura, Rajputi Chura, Painting Bangles, Miniature Painting Bangles, etc made from acrylic and having different shapes/colours with an excellent engraved art of designing with an artificial diamonds which are used to be fitted in different shapes/colours of its own kind. We have designed our product of our own styles and art, to cater the need of our valued customers in the market. Our company is being incorporated since the ancient age of Maharajas in the Kutch-District of Gujarat State, India in the name of K.M. Maniar and having a very good demand of our product since ancient times of Legend of Maharajas. Now, our company has been shifted in the heart of Ahmedabad city of Gujarat State, India and looking to the potentiality of our products in the State of Gujarat, as well as in the nation-wide, we are going to divert our interest in the Export Market.